Discussion in 'Missed Ads' started by Nameless, Apr 27, 2014. Is anyone else seeing this ad? Yes i have google ads disabled but even so i shouldnt be seeing it with adguard should i? Also seems to be only with this search term at the moment too, other things i searched for didnt bring an ad so imjust curious as to why im getting it. cannot confirm with the link you provided, however trying to search for m&s results in the same type of advert you've seen. seems to occur when you search for some name brands. i've also realised(confirmation needed) that a search term with a space will affect the results of filtration. 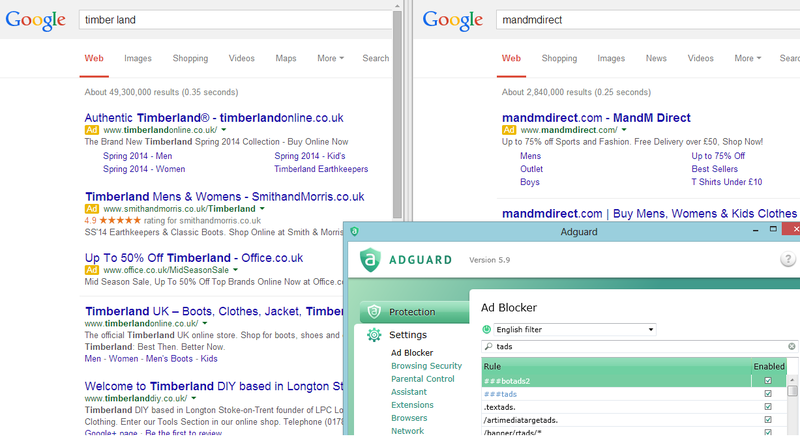 so for example, searching for timberland will not result in the ad in the results but searching for timber land will. Thanks for the confirmation rickoh i got ads with timberland & timber land, this code via the inspector seems to remove them though. would fit the bill in my view. True, i jnever thought about removing it if im honest and forgot as im always put onto co.uk even when im on my vpn. Cannot reproduce it. I've tried almost everything. The block with ._Vb class also has id="tads" which is blocked by Adguard. If i open the browser and search for timberland, timber land and/or mandmdirect there is a 99% chance i get an ad, if i keep refreshing the page the ad will eventually be removed and not reappear unless i close the browser and re-open it, if i use the code above for the class its never seen. Edit: Well ive never seen the ad. and this keeps on getting interesting. have you tried clicking the ads ? in my case, nothing happens in Firefox while in Chrome a blank page is loaded. Never clicked them rick but i have just now and they load for me lol have you tried refreshing after it loads a blank page? I know if im on hotukdeals and click go to offer i have to refresh the blank page, not sure why as not looked into it or tried it without adguard yet been bust with other things. Why, why do you see them? I've tried switching IP to UK, tried signing in and out, an google's serp is still clean. I have no idea avatar the ads seem to work odd maybe rick can confirm this his end too. Disabled adguard loaded the browser and typed "timber land" i then pressed enter the ads appeared as i planned, i then refreshed the page a few times the ads disappeared. Adguard with the filter i added no ads. WFP network driver disabled - I dont use metro so dont think its required. Don't know what other information might help, if you can think of anything let me know. tried refreshing the blank page in Chrome, still does not load the page. refreshing the page multiple times as you suggested, no the ads are still there. can confirm the filter you provided works. interestingly i have the WFP network driver enabled and run the same OS as you. wow it was right before me all this time. in my case the "Filter for useful ads" is enabled and so on Google all the name brand ads are visible as they are deemed useful. now we have an issue, clicking them yields no result as i indicated earlier. like finding a set of missing keys, happens to all of us. its wednesday you're almost through. the pages still do not load unfortunately. Firefox now loads the same blank page that Chrome does when the ad links are clicked, disble Adguard and the redirection works as it should.